Exclusively For Resident-Contractors Relations In Private Home Maintenance & Improvement Priorities In America! Welcome To The 1st National Repository For Your "SERVICE BOOKLET!" 1. Researching Contractors in your geographic area or in/from OTHERS. 3. Lots Of Strategic Contract Screening Tips. Home Is The Best Wonder Of The World! You Are The Best Wonder Of Your Home! NOTE: BECAUSE HGRBS (SPONSOR) IS UNDERGOING NETWORK UPGRADES SOME LINKS IN THE "SERVICE BOOKLET" HAVE BEEN DEACTIVATED. WE ARE GRADUALLY REACTIVATING THESE LINKS. CONTACT WHEN ANY LINKS YOU CLICK ARE FAULTY. TECHS WILL THEN PRIORITIZE YOUR REQUEST. 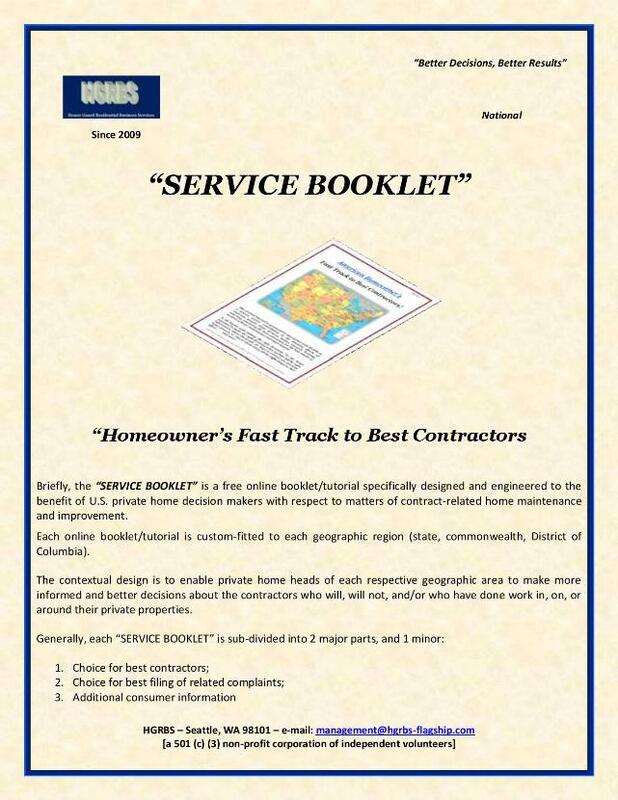 The "SERVICE BOOKLET" Is One Of The Best Guides You Can Have As An American Private Home Head. Now you can develop more leverage in the choices made requiring assistance of home improvement contractors. Please Find Your Geographic Area Below, Click On The Link, And Enjoy Your Own Area's Free Online Edition! The "SERVICE BOOKLET" for Your Geographic Area Contains Strategic Tips Along with Special Hyperlinks to Crucial Private and Government Offices. The Hyperlinks Are Also Instrumental In Providing You with Accurate, Up-to-Date Data to Enable You to "Validate" the Legal Status of Contractors Who Want to Work in Your Home/On Your Property, in Your Respective Area. There Are Also Useful Tips for Dispute Resolution, and Other Resident-Friendly Information. Home is the best wonder of the world. You are the best wonder of your home. Please always know as much as you possibly can about contractors you are thinking about trusting for your home project. Most residents who are on the list of those scandalized by contractors thought it would be more convenient to trust them blindly or on "gut feelings " than it would be to devote the time necessary to doing thorough enough "service validations" on them. Please do not let this happen to you.